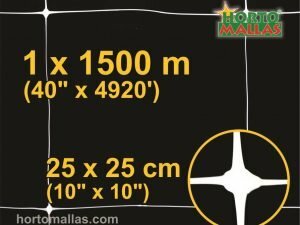 Every farmer and horticulturist strides to increase crop yields, by either increasing plant density or finding a way to reduce costs while increasing production, and the method chosen for vegetable support with HORTOMALLAS trellis netting will play a key part in the economic model and final outcome. 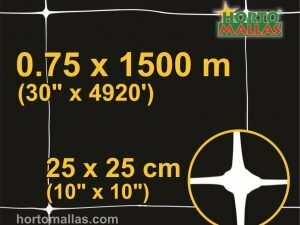 Vegetable support is essential for training plants, HORTOMALLAS is the most recognized brand. 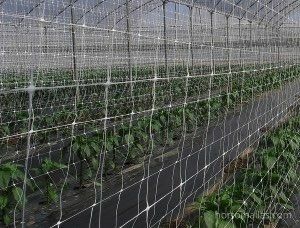 HORTOMALLAS vegetable support netting will substitute the traditional raffia trellising system as it is much faster to install (labor savings of about 2/3, plus a reduced number of posts and stakes necessary and this also saves money), it is re-usable (amortization over a longer period of 3 crops in open air cultivation), and the most important aspects of the use of vegetable support netting is agricultural as this type of vegetable support will 1) increase air flow by extending the plant´s branches vertically, decreasing diseases brought and induced by humidity 2) improve solar exposure allowing a greater photosynthesis and growth of the plant and fruits 3) reduce mechanical stress due to tyeing and fastening operations during tutoring therefore increasing fruit weight instead of having to wait 3-4 days until the plant goes into production mode again while it adjusts its leaves toward the sun (we have a very complete study that shows how mechanical stress reduces yields up to 10%, please send us an email requesting this document and we will gladly send it to you) 4) will it decrease the mechanical spreading of diseases due to the hands of workers touching one infected plant (virus, bacteria or fungi) during tutoring with raffia (therefore reducing the costs of chemicals). 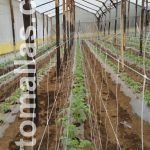 Any type of virus or bacteria and fungus that comes in contact with the workers´ hands, especially during the early stages of plant growth, can be devastating to any tomato, pepper, eggplant or cucumber crop. 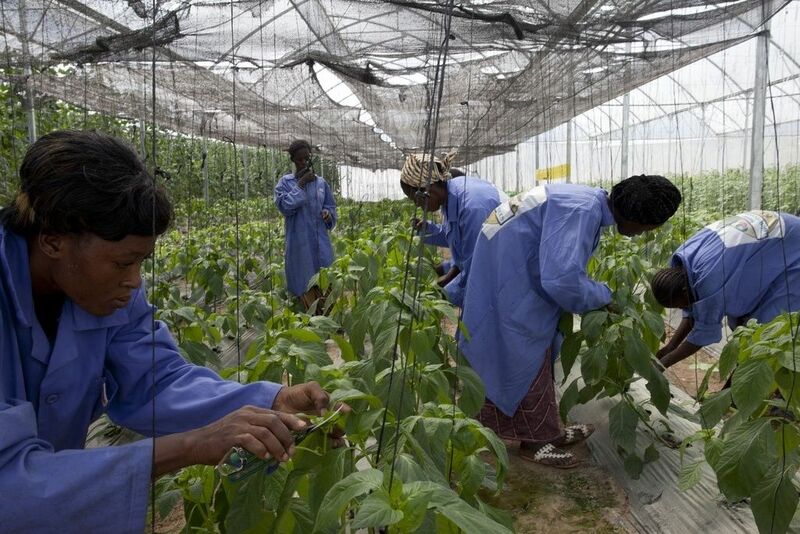 At this growth stage the plant is very susceptible to diseases and it is when workers using raffia as a trellising system will touch and guide and tutor and train each branch almost on a daily basis. Tutoring by hand and raffia will transmit pathogens from plant to plant at an exponential rate. This continuous coming in physical contact with the plant by the worker, means that unless there are excellent sanitary protocols in place, the plant will eventually come in contact with a vector (in this case the hands) carrying the pathogen unknowingly. In a few days these actions can be a lot more harmful than damage done by white flies or thrips. 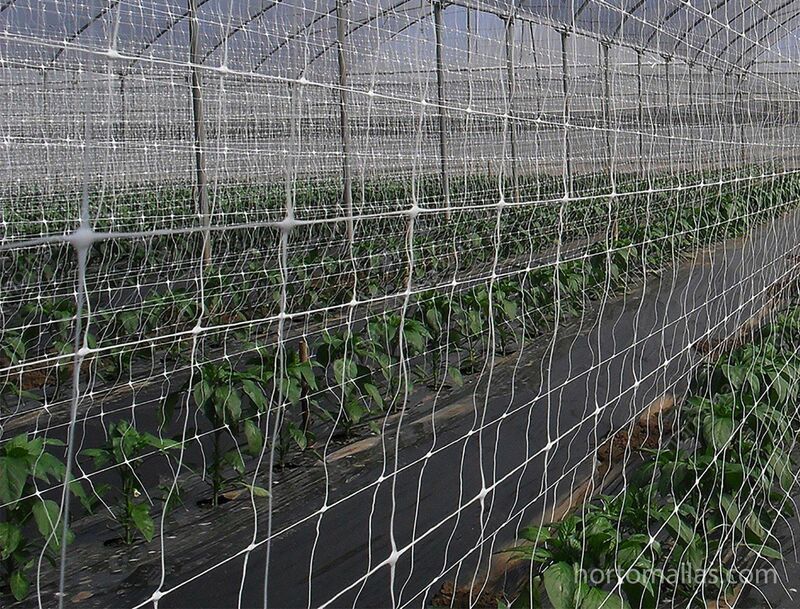 HORTOMALLAS vegetable support netting allows the plant to grow naturally and organically through its open meshes and lean on the horizontal strings as the plant starts loading with the fruits, with very little (if any) help from workers doing the plant training. 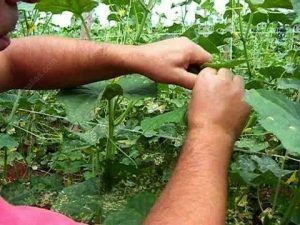 Under these conditions and practices the crop will be less subject to diseases and stress, both being causes of lower fruit production and quality. 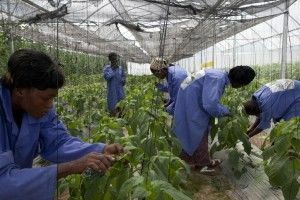 Training Plants with Raffia can be Devastating for Vegetables Crops. 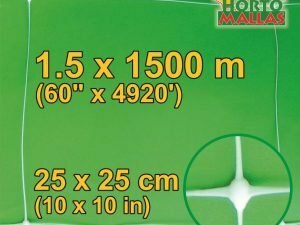 The best aseptic vegetable support is HORTOMALLAS. 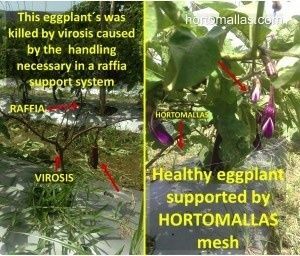 When the grower includes HORTOMALLAS in the organic orchard, the reward will be larger and healthier vegetables tutored by this aseptic and reusable vegetable support system. definition See the advantage of training vegetable plants.